I buy 7"s from Trouble In Mind like it's my job. I have every single they have put out on the limited colored vinyl first pressing. It's a fun little collection to be working on, but at some point I'm wondering if I'll need to start picking and choosing which ones to buy. It's not that anything they're putting out is bad; but I feel like they used to do a lot more garage-y pop bands and not so many psych bands. If nothing else, I'll surely complete the first 50 7"s and we'll see where we go from there. For the A-side "Italian Summer." 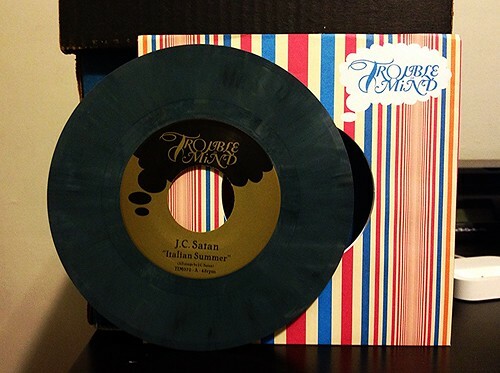 J.C. Satan are working with a big time 60's vibe. While it leans more towards a mid tempo flowery children sort of vibe, it's just not quite catchy enough to keep my interest. The mellow verse does lead into a louder, fuzzier chorus, but I just need a bit more oomph. The flip side, "I Don't Feel Like Dancing" definitely is a bit more heavy handed with the psych touch. The song kind of drones on with a guitar that sounds like it's underwater. As far as this sort of thing goes, J.C. Satan is decent enough at it, but it's just not really my cup of tea.